I am a beginner coin collector and just love this coin. I got exactly what I wanted, shipping was fast, and your return policy is great. I'm hooked! First it wasn't in as good as condition as they made out it was on tv, but then how do i know what a coin that old is sppose to look like. I still like it. I don't know how I got this impression ,but I thought it came in a case. I just saw others and they had the little case with them for display. So all in all i was somewhat disappointed in it. 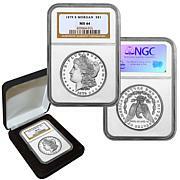 i didn't order anymore from HSN, I did from the US Mint, they come with the case. This is the second Morgan for me, Mom's Birth coin. I'm a bit disappointed in myself for not realizing this coin does not come in any kind of display box. I have all of the HSN coins displayed on my wall and assumed this one would be in a velvet box. Oh well I've order a slab display box and have other to add to it. Just wish I didn't have to go to the additional expense to display it. The coin can be gotten elsewhere for less $$ with no display box. 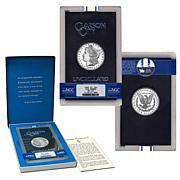 HSN's coins usually stand out because of the included display box. Lesson learned. shipping handling and tax not cost effective . 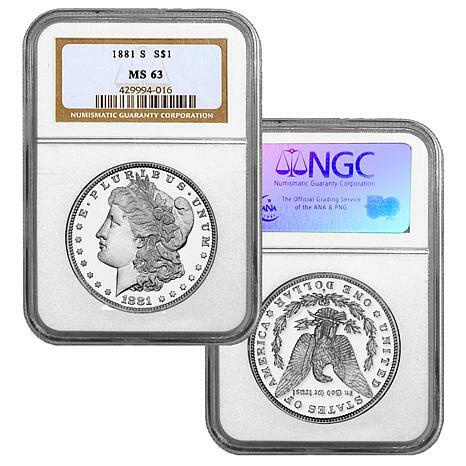 . .
Really a beautiful coin but for the grade and cost the coin was over priced to begin with plus shipping, handling and tax which I should not have to pay because I am in the state of Texas . . . the coin was not a good value. I really wish I could of kept the coin it was very nice but not cost effective can pick the same coin locally or from the "Coin Vault" vender for 60 -75 dollars no shipping handling and no tax. You did ship the coin quickly and it was packed very nice. Thank you.